If your computer is over a year old, studies show that it is more than likely that your computer is not running as nearly as fast as it should be/ its not as fast as it was when you first got it. If you feel you may not be getting what your computer is capable of, here are 5 reasons it might be. 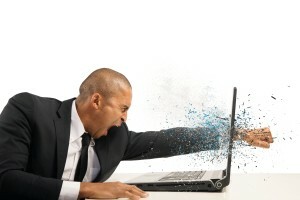 Don’t end up like the man above, if you find your computer not running up to speed, contact Computer Service Now for PC repair and PC tune ups.